Winter storms and cold weather have truly hit the Philadelphia and Chicago areas, but my heart is very warm as I have been spending this week with the students from the Allegheny College Newman Association. 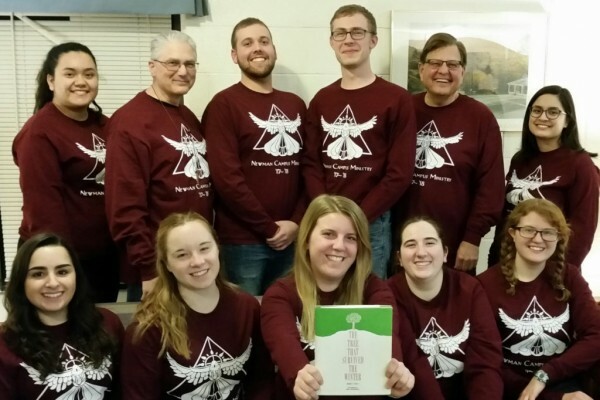 This is their fifth year coming to the Sisters of the Holy Family of Nazareth Provincialate in Chicago to do a week of service during their Christmas break. It is a great way to start the New Year. Along with service experiences, the students have the opportunity to pray, share meals and laugh with our sisters. There is an abundance of sharing happening on all sides. This year we have been looking at a book called The Tree That Survived Winter, by Sister Mary Fahy. It is a wonderful book that speaks of being faithful during all the winter times of our life while we continue to grow. Throughout the week we have been also looking at the Core Values of our community: faithful listening, finding God in the everyday, and loving relationships. The students have been connecting these with all they have been doing while praying and looking at how service has kept them faithful in their role as a Catholic college student. There have been some wonderful conversations, and in the coming reflections, I hope to share them with you. One of the students did share with me that lately she has been having a hard time but is remaining faithful because of the love she shares with others while doing service. Together, they bring the love of Jesus to others. Their spirit radiates Jesus, and this in turn brings joy to others. In a small way, this makes the world a brighter place. Now looking at ourselves, how does a life of service (no matter what it is) keep us faithful? Do we take the time to reflect on why we are doing what we do and how it affects other people? Does it bring us/them closer in our relationship to God? Are we able to survive the winters of our life and continue to grow and value the experiences we have had? Change, movement, stretching and growth can all be challenging. We need to continue to look beyond the winter. How do you do that personally? My prayer is that you take some time this week to look at these questions and if you get a chance check out the story of The Tree That Survived Winter.